Rav Belsky was one of the greatest Torah minds of his generation, a preeminent posek and rosh yeshiva whose guidance was sought by tens of thousands of Jews across the globe. His genius was unparalleled and his breadth of knowledge unsurpassed in his time. Born on August 22, 1938, Rav Belsky was a son of Rabbi Berel and Chana Tzirel Belsky. His maternal grandfather was the legendary Torah pioneer, Rav Binyomin Wilhelm zt”l, founder of Yeshiva Torah Vodaas. Rav Belsky learned at and received semichah from Yeshiva Torah Vodaas in 1962, and from Rav Moshe Feinstein zt”l in 1965. He later studied at Bais Medrash Elyon in Monsey, NY, for a number of years, becoming one of its most prominent talmidim. 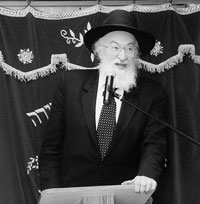 Rev Belsky served as the senior posek of the OU Kashrus Division, a position he held since 1987. He served as rov of Camp Agudah since 1967. Rav Belsky’s chiddushei Torah have been printed in volumes titled Piskei Halachos, Einei Yisroel on Chumash, Sha’alos U’Teshuvos Shulchan Halevi, and other publications. In addition to his gadlus in Torah, Rav Belsky possessed a heart that was open to all Jews, and he gave of his time, wisdom and abilities to help people from across the spectrum of Yiddishkeit. Despite the great burdens he carried on his shoulders, guiding so many Jews in so many different facets of life, Rav Belsky continued to extend himself on behalf of others, opening his home to people who came to him for help at all times of the day and night.